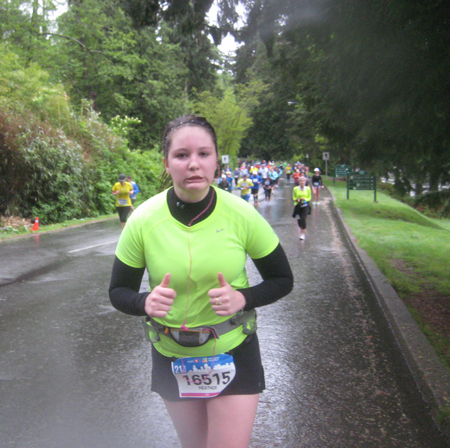 BMO Vancouver half marathon, wow! This run was not about me, not about my racing goals, not about personal besting. It was about super freaking AMAZING diabetes awesomeness! When my fellow T-1 girlfriend, Reluctant Runner, texted me many months ago to tell me she was running the BMO half marathon, I was intrigued. You see, this girl, as the name of her blog indicates, is not overly in love with the running scene. She’s a superstar in the water and on the soccer field, but long-distance running, she does solely for her health, not endorphins. Her previous attempts at halves have been miserable: diabetes refused to cooperate, racing goals seemed to crumble every time she crossed the starting mat, and those hills, ohhh, they were more than just a prickle in her side, they were the devil incarnate. I mulled over her text for all of two seconds before the light bulb went off. “Care for a partner?” I asked. My whole intent with this run was to make it as enjoyable as possible. If that meant, she needed me to carry things for her, or needed extra fuel, or needed me to talk her ear off, or needed me to shut the hell up, I would do it. If she needed me to increase the pace, or slow it down, or tell her she was doing freaking amazing, or encourage her to dig deep, to put that evil naysayer out of her head, to think about the massage, then beer, (yes, beer) waiting for her at the end, I would do it – all for the sake of seeing her finish with a smile on her face. I didn’t register for this race, which meant I couldn’t exactly start with everyone else. 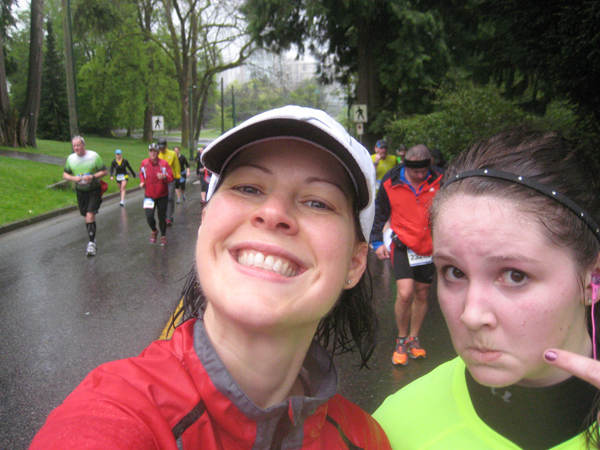 Instead, I met up with Reluctant Runner at the first water station, about 2 km out from the start. As soon as I got on the course, the conversations just started pouring out for both of us. We haven’t seen each other since Little Ring was just a few weeks old (She lives in the next province over) making this a perfect catch-up time, and a good take her mind off of what she was doing time. 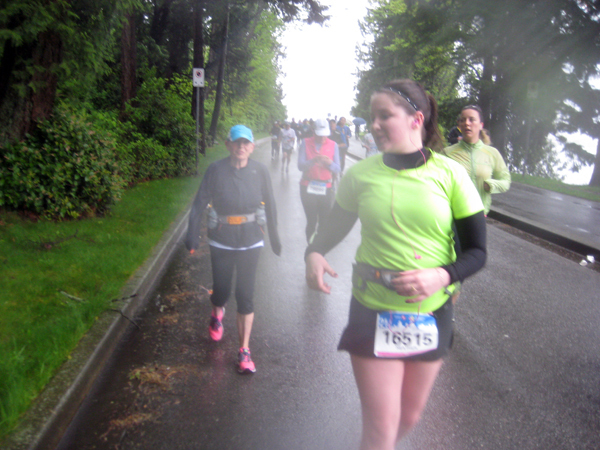 The rain was pouring down like mad, I was soaked from head to bleeding, chafing toe in two seconds, but still smiling… as was the crowd, albeit mostly males, at about the 3-4 km mark when on the Cambie Bridge a couple of girls cheered from high up in their condo – stark naked!!! We ran. We walked. We laughed. She grumbled. I giggled. She danced. She hurt. She sang. She cursed the hills. She kept going. We got a kick out of the signs, although, the one with all-caps SUICIDE at about 2-3 km remaining might have been a little uncouth. We posed for photos, oh did we ever (pretty sure this will be the first race where I actually have a nice one taken!). And while I was encouraging her, championing her on every chance I got, she was doing the same for others, purposely running over to a few women, who looked as though they were done, putting her hand on their back, and even if she didn’t believe it for herself at times, told them they were doing great, they were almost done, they could do it. That was incredible! Cheering on fellow half marathoners. The whole way I couldn’t believe how fast the kilometre markers were clipping by. 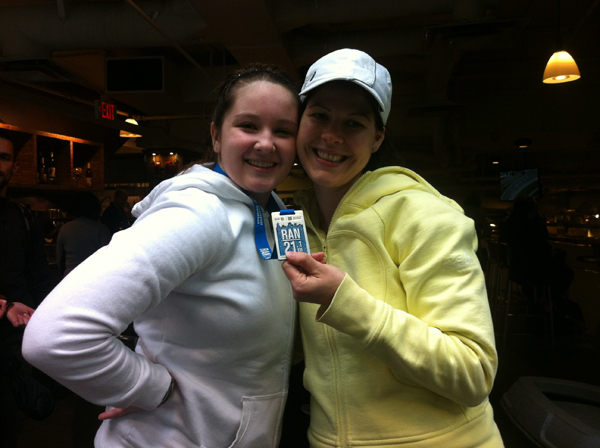 This was my first race that I’d actually run with a friend by my side. Every other race I’ve done has been on my own, with my own thoughts, my own pressures, my own judgements, my own evils. But this one, there was none of that. I was smiling from start to finish. I loved that. And yes, it was a pace slower than the pace I normally run, but I think sometimes, especially when you’ve been in a funk like I have lately, it’s those kinds of runs that can recharge you for those harder paces again. Least, that’s what I’m hoping for. 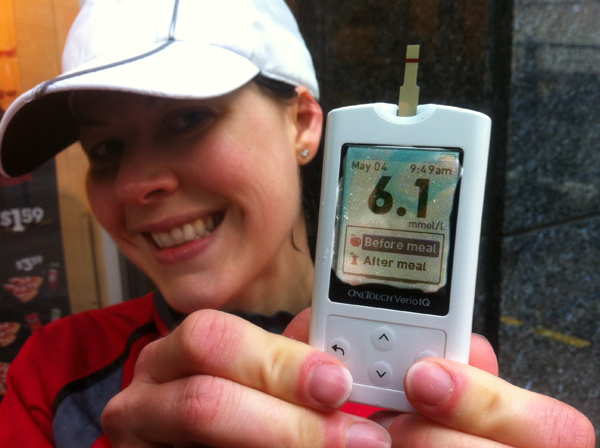 Even the post-race BG test had me grinning from ear to ear! Oh, and yeah, she TOTALLY PB’d by 12 minutes!!! So proud. So happy. So loved today. 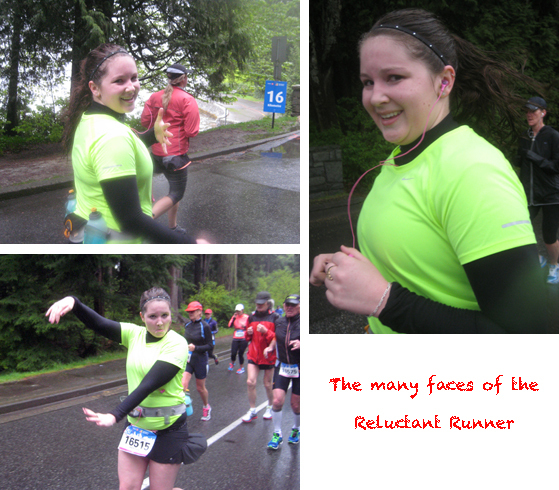 This entry was posted in Races, Running and tagged BMO Vancouver Marathon, half marathon, Reluctant Runner, type 1 running. Bookmark the permalink.